Powers/Abilities: Watchlord possesses telekinesis at molecular sharpness, as well as pyrokinesis. He is also a skilled marksman. Watchlord can modify and transform objects, regardless of whether it is made of organic matter or not. The bigger the object, the bigger the effort to transform it. He is capable of lifting rocks that weighed several tons and claimed that he had needed several hours to recharge his powers. He apparently aged at a sub-normal rate. History: (Amazing Adventures II #8/2 (fb)) - At the end of the WWII, the Soviet troops invaded Germany. Looking for spies and politicians they captured the father of the young boy who would become Watchlord. The man was killed, even though he wasn't a politician. This fed the boy's anger against the Soviets. The boy found refuge in a church. The priest, one of his father's friends, hid him in the attic, near some boxes left there from the Nazis. The boxes contained shining radioactive isotopes, but the priest didn't know this. The radioactive material in the boxes affected the boy's body, but the effects sprung years after, when the boy became a man. (Amazing Adventures II #8/2 (fb) - BTS) - At an unknown time, the man who would become Watchlord went to the USA, which would became his adoptive nation. The man understood that he could modify the object with the power of his thoughts. He understood (believed) that this was a gift for him to "cleanse the nation" (his adoptive nation) from all the "Stalinian race". (Amazing Adventures II #8/2 (fb) - BTS) - Watchlord tricked Ivan Petrovich, drawing him to the Carlyle Hunt Lodge (an old chalet, out of New York, on the hills) and captured him. Thanks to the registration of Ivan's voice he succeeded in luring the Black Widow there, too. (Amazing Adventures II #8/2) - When the Black Widow arrived at the chalet, she was attacked by two of Watchlord's henchmen. She almost overpowered them, but Watchlord intervened, knocking the Widow down with a blast from his hand (probably a telekinetic hit). With his powers he transformd the floor into a strait-jacket to bond Natasha. He then showed Natasha that Ivan was still alive and told them his story explaining why he wanted to kill them. Then, he set the chalet on fire with his mind-power, and he and his followers left the house to accomplish another mission. The Black Widow managed to set Ivan free using her Widow-Bite and Ivan rescued her before she could be burnt by the flames. Ivan understood that Watchlord and his henchmen were going to a private house, part of the Russian Embassy, to kill all the people inside. 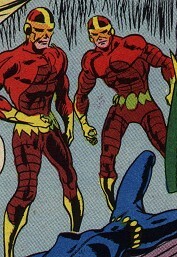 The two heroes ran to intercept the criminals. Ivan and Natasha ambushed the henchmen and a struggle started. Ivan fell, but Natasha knocked the henchmen down. Watchlord saw the Black Widow from afar and tried to entangle her using the roots of some trees, but Natasha blasted them with her last Widow-Bite. Annoyed, Watchlord used all his remaining power to induce a landslide. Natasha dodged the rolling rocks, but she was struck on the temple by a bullet shot by Watchlord, and she collapsed. But the landslide raised by Watchlord was bigger than he thought, and a second wave fell from the mountain. Without the chance to use his power, Watchlord could not stop the rockslide, which knocked him over and killed him, though missing the Black Widow. Comments: Created by Roy Thomas?, Don Heck? and ???. How many other people came in contact with those glowing, radioactive boxes full of isotopes? The priest? Are there other super-Germans or super-Soviets still around, or their mutant sons? They all probably died by radiation poisoning. Watchlord's real name was revealed in Marvel Atlas#1. other "Watch" characters, or to anyone else with a similar name. Despite their costumes, they were normal humans with some fighting skills. Two of them created some problems for the Black Widow, but after the initial struggle she could easily manage them. They followed Watchlord because he paid them well for every Russian they captured without his help.